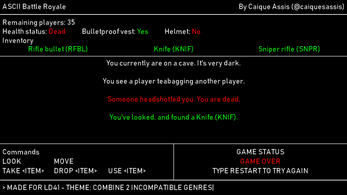 ASCII Battle Royale was made for LD41, which had the "Combine 2 incompatible genres" theme. Experience all the thrills of the battle royale genre like not finding weapons, not finding ammo for your weapons, being headshotted without knowing where the shot came from, and so on, now in text format! i kinda wish guns started with one bullet in them or something. I survived longer than most PUBG matches. 10/10 game.